Your wedding date will be written in the stars with our unique Constellation Save the Date Cards! 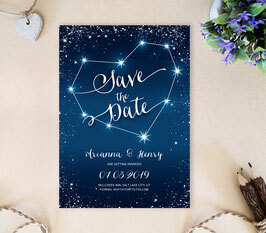 Our stunning cards are decorated with an eye-catching heart constellation, shining stars and your wedding information. The cards are printed on shimmering card stock for an extra touch of sparkle.